Holden Decor Manyara Navy/Teal Wallpaper is a great way to add colour and character to your walls this season and beyond. This exciting wallpaper is part of the beautiful Glasshouse Wallpaper Collection. So it is sure to make a welcome addition to any room. 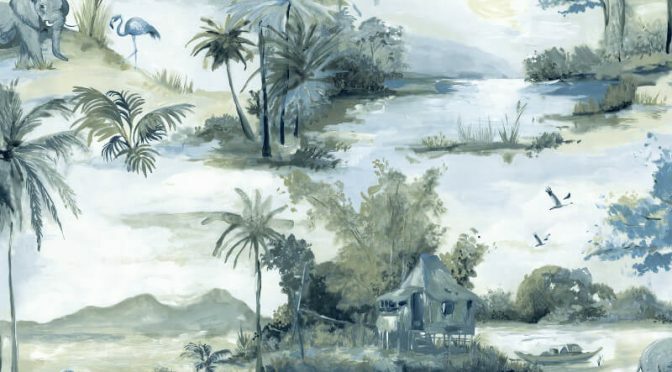 This wallpaper features a tropical landscape and has a tranquil feel. Furthermore, it is brought to life with a fashionable navy and teal colour scheme for a great look. Finally, use the Holden Décor Manyara Navy/Teal Wallpaper alone or team with coordinating designs from the same collection. A great choice for updating a living room or bedroom this season.